The Consolidation of the Orbán Regime: Towards ‘Authoritarian-Ethnicist Neoliberalism’? This chapter analyses the seemingly contradictory fusion between authoritarian state practices and neoliberal economic policies in Hungary under the Orbán regime. Since returning to power in 2010 on a popular backlash against austerity, the hard-right Fidesz-Kereszténydemokrata Néppárt (Fidesz-KDNP) government, led by the charismatic and dexterous Viktor Orbán, has carried out a root-and-branch transformation of Hungarian society. 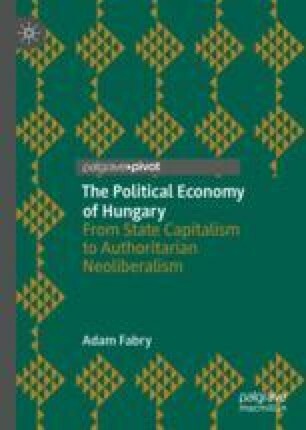 While officially proposing a break with neoliberalism at home and abroad, the chapter argues that the Orbán regime has rather deepened it, producing a specific variety of neoliberalism, which skilfully combines some of the central tenets of neoliberalism (maintenance of a balanced budget, introduction of a flat tax system, and the pursuit of regressive social policies) with ‘authoritarian-ethnicist’ measures that seek to co-opt, coerce, or manufacture consensus among subaltern groups in society against alleged ‘enemies’ of the Hungarian nation. While Orbán’s ‘illiberal’ politics have been strongly criticised by international and regional institutions, such as the International Monetary Fund (IMF) and the European Union (EU), they have taken little concrete action against the Hungarian government. The reason for this is pragmatic: the Orbán regime has not only been a model for neoliberal austerity in Europe since the 2008 crisis, but also its authoritarian-ethnicist policies are not that different from those practised by other EU states. ‘800 millióért tudtuk meg, hogy Magyarország jobban teljesít’. (2014, January 2). Origo.hu. Retrieved January 18, 2014, from http://www.origo.hu/itthon/20140102-800-milliobol-tudtuk-meg-hogy-magyarorszag-jobban-teljesit.html. A Nemzeti Együttműködés Programja. (2010, May 22). Government of Hungary. Retrieved from http://www.parlament.hu/irom39/00047/00047.pdf. Ádám, V. (2014, August 18). Drámai adatok Magyarországról – így terjed a szegénység. Napi.hu. Retrieved August 23, 2014, from http://www.napi.hu/magyar_gazdasag/dramai_adatok_magyarorszagrol_igy_terjed_a_szegenyseg.585336.html. Balogh, E. S. (2015, May 29). The Last Five Years of the Orbán Government, Fact and Fiction. Hungarian Spectrum. Retrieved August 29, 2016, from http://hungarianspectrum.org/2015/05/29/the-last-five-years-of-the-orban-government-fact-and-fiction. Book, S. (2018, February 9). German Mittelstand Reaps Dividend of Eastern European Autocracy. Handelsblatt. Retrieved from https://global.handelsblatt.com/companies/for-german-business-eastern-europe-autocracy-pays-dividends-881082. Bozóki, A. (2015b). The Politics of Worst Practices: Hungary in the 2010s. Centres de Recherches Internacionales, Sciences Po, February 2015. Retrieved August 2, 2016, from http://www.sciencespo.fr/ceri/fr/content/dossiersduceri/politics-worst-practices-hungary-2010s. ‘Hungarian Residency Bond Program’. (n.d.). Retrieved August 23, 2016, from http://www.residency-bond.eu/residency-bond-program.html. ‘Hungary: Energy Prices Cut Again’. (2014, January 25). Euronews. Retrieved August 19, 2016, from http://www.euronews.com/2014/01/25/hungary-energy-prices-cut-again. ‘In Orbán’s Opinion Miklós Horthy was an Exceptional Statesman’. (2017, June 21). Hungarian Spectrum. Retrieved June 26, 2017, from http://hungarianspectrum.org/2017/06/21/in-orbans-opinion-miklos-horthy-was-an-exceptional-statesman. Kirchick, J. (2012, March 16). Hungary’s Pit Bull Prime Minister. Foreign Policy. Retrieved September 4, 2017, from http://foreignpolicy.com/2012/03/16/hungarys-pit-bull-prime-minister. Kiss, A. (2015, February 20). Hungary: Working Poor, Minimum Wage and Minimum Income. Eurofound. Retrieved August 10, 2016, from http://www.eurofound.europa.eu/observatories/eurwork/articles/working-conditions-industrial-relations/hungary-working-poor-minimum-wage-and-minimum-income. Koltai, Mihaly. (2014, December 24). And So It Begins? First Cracks in the Orbán-Régime. LeftEast. Retrieved March 12, 2015, from http://www.criticatac.ro/lefteast/and-so-it-begins-first-cracks-in-the-orban-regime. Koltai, Mihaly. (2017, July 5). Hungary: The End of Democratic Illusions? Jacobin. Retrieved September 7, 2017, from http://jacobinmag.com/2017/05/hungary-central-european-university-george-soros-protests. Koltai, Mihály. (2018, April 2). The Economics of “Orbánism”. LeftEast. Retrieved June 4, 2018, from http://www.criticatac.ro/lefteast/the-economics-of-orbanism. Komiljovics, M. (2012, July 17). Hungary: Almost 7,000 Public Sector Jobs Cut. Eurofound. Retrieved August 18, 2016, from http://www.eurofound.europa.eu/observatories/eurwork/articles/almost-7000-public-sector-jobs-cut. Krémer, B. (2014, June 17). Mennyire lett kifosztva a társadalom? Beszélő. Retrieved August 19, 2016, from http://beszelo.c3.hu/onlinecikk/mennyire-lett-kifosztva-a-tarsadalom. ‘Migrant Crisis: UN Criticises Hungary over Border Controls’. (2016, July 9). BBC News. Retrieved August 23, 2016, from http://www.bbc.co.uk/news/world-europe-36753648. MTI. (2011, March 21). Fidesz Parliamentary Leader Apologises for “Poverty Remarks”. Politics.hu. Retrieved December 11, 2014, from http://www.politics.hu/20110321/fidesz-parliamentary-leader-apologises-for-poverty-remarks. MTI Econews. (2016, March 30). EU Suspends €121 mln in Development Funds Meant for Hungary. Budapest Business Journal. Retrieved August 24, 2016, from http://bbj.hu/economy/report-eu-suspends-121-mln-in-development-funds-meant-for-hungary_113694. ‘Orbán: a következő 15–20 évben egy nagy kormányzó párt lehet’. (2010, February 16). Heti Világgazdaság. Retrieved August 3, 2016, from http://hvg.hu/itthon/20100216_orban_viktor_egy_nagy_kormanyzo_part. ‘Orbán Calls “Ethnic Homogeneity” a Key to Success’. (2017, March 1). Euractiv.com. Retrieved September 5, 2017, from https://www.euractiv.com/section/justice-home-affairs/news/orban-calls-ethnic-homogeneity-a-key-to-success. ‘Orbán Snubbed by Romanian PM as Nyirő Affair Escalates’. (2012, June 4). Politics.hu. Retrieved August 23, 2016, from http://www.politics.hu/20120604/orban-snubbed-by-romanian-pm-as-nyiro-affair-escalates. Orbán, V. (2014). A munkaalapú állam korszaka következik. Speech at the 25th Summer University and Youth Camp, Tusnádfürdő (Băile Tuşnad), Romania, July 26, 2014. Retrieved June 4, 2018, from http://www.kormany.hu/hu/a-miniszterelnok/hirek/a-munkaalapu-allam-korszaka-kovetkezik. Otarashvili, M. (2014, July 30). Hunger for Power in Hungary? The Alarming Nature of Viktor Orban’s New “Manifesto”. Foreign Policy Research Institute. Retrieved September 4, 2017, from https://www.fpri.org/2014/07/hunger-for-power-in-hungary-the-alarming-nature-of-viktor-orbans-new-manifesto. Posaner, J., & Ariès, Q. (2016, December 14). Shrugging off Concerns, Europe Waves Through Hungary’s Controversial Nuke Deal. Politico.hu. Retrieved September 5, 2017, from http://www.politico.eu/article/europes-radioactive-embrace-hungary-russia-paks-ii-project-nuclear-reactors. Rowlands, C. (2013). “Gypsies are Animals”—Racism on Hungary’s Right. New Left Project, 1 February 2013. Retrieved December 11, 2013, from http://www.newleftproject.org/index.php/site/article_comments/gypsies_are_animals_racism_on_hungarys_right. Scheppele, K. L. (2012, April 19). The New Hungarian Secret Police. Paul Krugman New York Times Blog. Retrieved August 16, 2016, from http://krugman.blogs.nytimes.com/2012/04/19/the-new-hungarian-secret-police. Szurovecz, I. (2017, September 26). Nőtt az oktatásra szánt pénz, már majdnem ott tartunk, ahol 15 éve. Abcug.hu. Retrieved June 5, 2018, from https://abcug.hu/nott-az-oktatasra-szant-penz-mar-majdnem-ott-tartunk-ahol-15-eve. Tamás, G. M. (2014, May 5). Hungary: A Black Hole on Europe’s Map. LeftEast. Retrieved March 12, 2015, from http://www.criticatac.ro/lefteast/hungary-a-black-hole-on-europes-map. Than, K. (2010, July 22). Analysis: Hungary Risks Markets’ Goodwill with IMF/EU Failure. Reuters.com. Retrieved August 3, 2016, from http://www.reuters.com/article/us-hungary-imf-analysis-idUSTRE66H0UE20100722. Tóth, C. (2014, December 3). Senator John McCain Calls Viktor Orbán a “Neo-Fascist Dictator”. The Budapest Beacon. Retrieved from https://budapestbeacon.com/senator-john-mccain-calls-viktor-orban-neo-fascist-dictator. Udvarhelyi, É. T. (2014, November 21). Criminalising the Homeless—A State Strategy in Hungary. New Left Project. Retrieved August 3, 2016, from http://www.newleftproject.org/index.php/site/article_comments/criminalising_the_homeless_a_state_strategy_in_hungary. Verseck, K. (2012, June 6). “Creeping Cult”: Hungary Rehabilitates Far-Right Figures. Der Spiegel. Retrieved from http://www.spiegel.de/international/europe/right-wing-extremists-cultivate-horthy-cult-in-hungary-a-836526.html. Verseck, K. (2014, April 2). Wahlkampf in Ungarn: Orbáns Clan plündert die Staatskassen. Der Spiegel. Retrieved from http://www.spiegel.de/politik/ausland/ungarn-ministerpraeside. Viktor Orbán and Recep Tayip Erdogan are the Best of Friends. (2013, December 18). Hungarian Spectrum. Retrieved June 5, 2018, from http://hungarianspectrum.org/2013/12/18/viktor-orban-and-recep-tayyip-erdogan-are-the-best-of-friends. Werkhäuser, N. (2015, September 23). Hungary’s Orban Criticizes Merkel’s “Moral Imperialism”. Deutsche Welle. Retrieved August 24, 2016, from http://www.dw.com/en/hungarys-orban-criticizes-merkels-moral-imperialism/a-18736240.